New images from NASA's Cassini spacecraft reveal a giant cyclone at Saturn's north pole, and show that a similarly monstrous cyclone churning at Saturn's south pole is powered by Earth-like storm patterns. 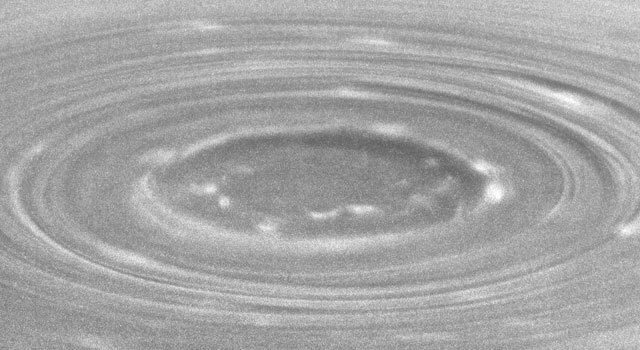 The new-found cyclone at Saturn's north pole is only visible in the near-infrared wavelengths because the north pole is in winter, thus in darkness to visible-light cameras. At these wavelengths, about seven times greater than light seen by the human eye, the clouds deep inside Saturn's atmosphere are seen in silhouette against the background glow of Saturn's internal heat. 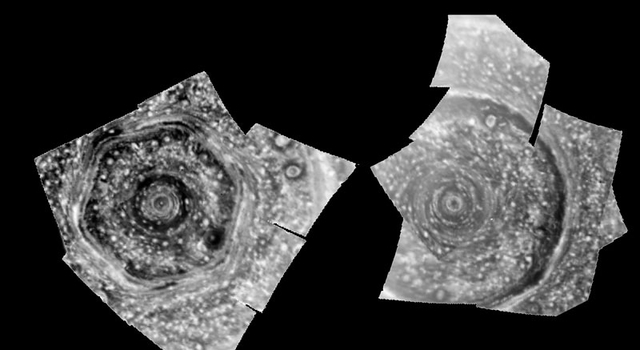 The entire north pole of Saturn is now mapped in detail in infrared, with features as small as 120 kilometers (75 miles) visible in the images. Time-lapse movies of the clouds circling the north pole show the whirlpool-like cyclone there is rotating at 530 kilometers per hour (325 miles per hour), more than twice as fast as the highest winds measured in cyclonic features on Earth. This cyclone is surrounded by an odd, honeycombed-shaped hexagon, which itself does not seem to move while the clouds within it whip around at high speeds, also greater than 500 kilometers per hour (300 miles per hour). Oddly, neither the fast-moving clouds inside the hexagon nor this new cyclone seem to disrupt the six-sided hexagon. New Cassini imagery of Saturn's south pole shows complementary aspects of the region through the eyes of two different instruments. Near-infrared images from the visual and infrared mapping spectrometer instrument show the whole region is pockmarked with storms, while the imaging cameras show close-up details. The new views are available online at: http://www.nasa.gov/cassini and http://saturn.jpl.nasa.gov. Unlike Earth-bound hurricanes, powered by the ocean's heat and water, Saturn's cyclones have no body of water at their bases, yet the eye-walls of Saturn's and Earth's storms look strikingly similar. Saturn's hurricanes are locked to the planet's poles, whereas terrestrial hurricanes drift across the ocean. "These are truly massive cyclones, hundreds of times stronger than the most giant hurricanes on Earth," said Kevin Baines, Cassini scientist on the visual and infrared mapping spectrometer at NASA's Jet Propulsion Laboratory, Pasadena, Calif. "Dozens of puffy, convectively formed cumulus clouds swirl around both poles, betraying the presence of giant thunderstorms lurking beneath. Thunderstorms are the likely engine for these giant weather systems," said Baines. Just as condensing water in clouds on Earth powers hurricane vortices, the heat released from the condensing water in Saturnian thunderstorms deep down in the atmosphere may be the primary power source energizing the vortex. In the south, the new infrared images of the pole, under the daylight conditions of southern summer, show the entire region is marked by hundreds of dark cloud spots. The clouds, like those at the north pole, are likely a manifestation of convective, thunderstorm-like processes extending some 100 kilometers (62 miles) below the clouds. They are likely composed of ammonium hydrosulfide with possibly a mixture of materials dredged up from the depths. By contrast, most of the hazes and clouds seen on Saturn are thought to be composed of ammonia, which condenses at high, visible altitudes. Complementary images of the south pole from Cassini's imaging cameras, obtained in mid-July, are 10 times more detailed than any seen before. 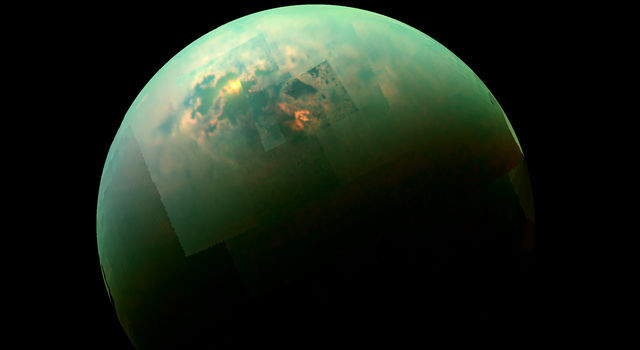 "What looked like puffy clouds in lower resolution images are turning out to be deep convective structures seen through the atmospheric haze," said Cassini imaging team member Tony DelGenio of NASA's Goddard Institute for Space Studies in New York. "One of them has punched through to a higher altitude and created its own little vortex." The "eye" of the vortex is surrounded by an outer ring of high clouds. The new images also hint at an inner ring of clouds about half the diameter of the main ring, and so the actual clear "eye" region is smaller than it appears in earlier low-resolution images. 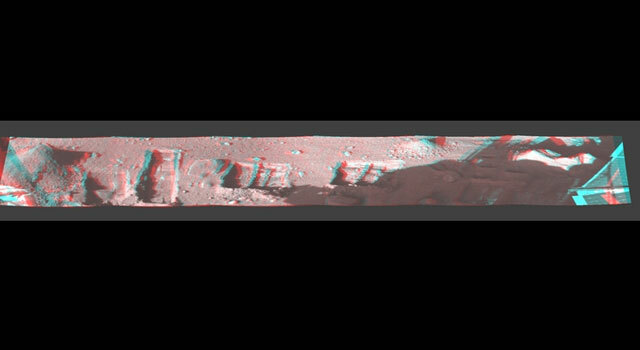 "It's like seeing into the eye of a hurricane," said Andrew Ingersoll, a member of Cassini's imaging team at the California Institute of Technology, Pasadena. "It's surprising. Convection is an important part of the planet's energy budget because the warm upwelling air carries heat from the interior. In a terrestrial hurricane, the convection occurs in the eyewall; the eye is a region of downwelling. Here convection seems to occur in the eye as well." Further observations are planned to see how the features at both poles evolve as the seasons change from southern summer to fall in August 2009. The Cassini-Huygens mission is a cooperative project of NASA, the European Space Agency and the Italian Space Agency. The Jet Propulsion Laboratory, a division of the California Institute of Technology in Pasadena, manages the mission for NASA's Science Mission Directorate, Washington, D.C. 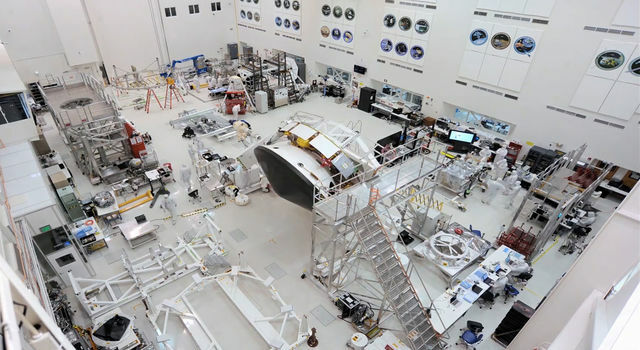 The Cassini orbiter was designed, developed and assembled at JPL. The visual and infrared mapping spectrometer team is based at the University of Arizona. 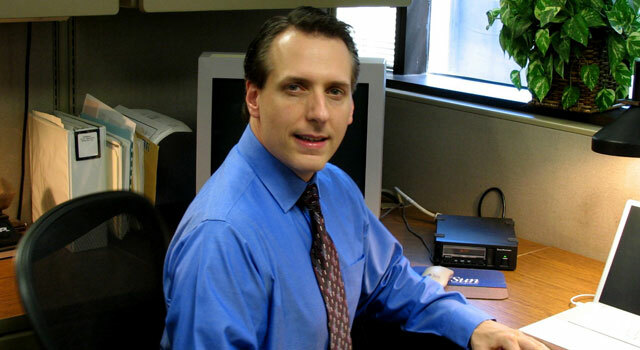 The imaging team is based at the Space Science Institute, Boulder, Colo.